We have successfully introduced green phosphors LaPO4:Ce, Tb (G4) or (Mg, Zn)Al11O19:Eu (G2) into TiO2 photoelectrode of dye-sensitized solar cells. 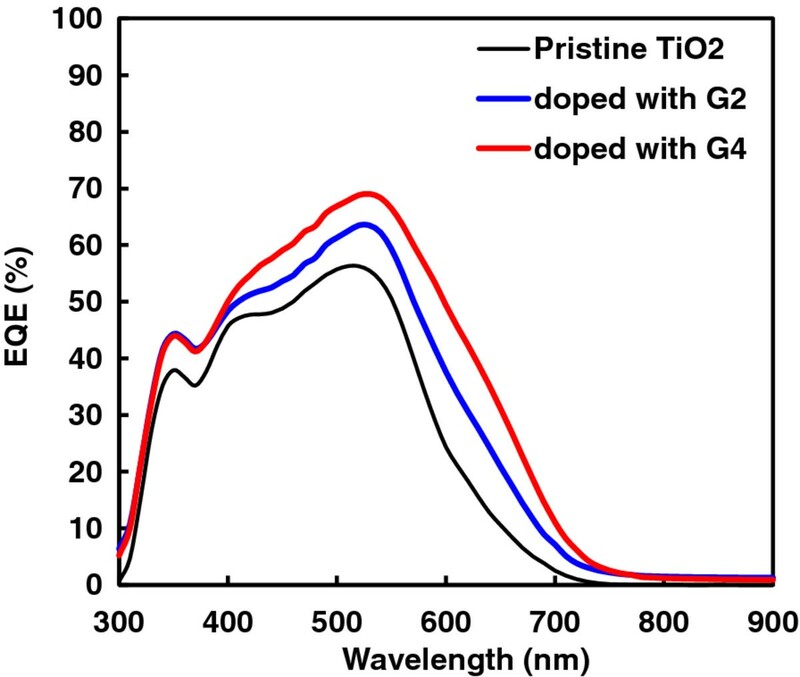 The conversion efficiency of the G4-doped device was enhanced by 30% compared with the pristine TiO2 photoelectrode. The green phosphor doped at 5-wt.% ratio contributed to the reduction of resistances of the surface and interface of the photoelectrode and to the great enhancement of the absorption spectrum in UV-visible and near-infrared regions. The internal resistances and absorbance of the photoelectrode directly affect the power conversion efficiency. Green phosphor plays an important role towards the realization of high-efficiency dye-sensitized solar cells. The uses of different types of nanostructured materials in dye-sensitized solar cells (DSSC) have attracted worldwide attention as a low-cost alternative to traditional photovoltaic device [1–5]. This is because nanostructures of materials enhance the surface area to allow a higher amount of dye molecules to be adsorbed, and the nature of electron transport in oxide nanoparticle films is fairly well understood. The scientific community is still struggling to find optimum nanostructures and materials for the best solution to overcome issues associated with stability, efficiency, and cost-effective mass production [6, 7]. Normally, in DSSCs, photons interact with dye molecules to create excitons. These excitons come into contact with nanoparticles/nanostructures at the surface of the photoelectrode and are rapidly split into electrons and holes. Electrons are injected into the photoelectrode, and holes leave the opposite side of the device by means of redox species (traditionally the I−/I3− couple) in the liquid or solid-state electrolyte used in DSSCs to ensure efficient electron transfer to the redox couple [8–11]. It is important to apply different materials and structures to enhance light photon interaction with dye molecules to achieve a higher proportion of excitons. Recent research shows that the implementation of a UV-absorbing luminescent wavelength converter (which is emitted at longer wavelengths) not only remarkably improves the photochemical stability of the DSSCs but also enhances the efficiency of the cell [3, 11–14]. LaPO4:Ce, Tb (G4) and (Mg, Zn)Al11O19:Eu (G2) have been widely used in tricolor phosphor lamps and PDP displays as highly effective green phosphor additives [15–18]. YVO4:Bi3+, Ln3+ (Ln = Dy, Er, Ho, Eu, and Sm) phosphors are proposed to be promising UV-absorbing spectral converters for DSSCs as they possess broad absorption band in the whole UV region of 250 to 400 nm and could emit intense visible lights. When excited by ultraviolet light, G4 emits 550 nm of light in the green region. Considering this point, the doping of green phosphors LaPO4:Ce, Tb or (Mg, Zn)Al11O19:Eu into TiO2 photoelectrodes could lead to higher efficiency in dye-sensitized solar cells. Field emission-scanning electron microscopy (FE-SEM) was used to determine the morphology of this hybrid photoelectrode. The absorption and luminescence properties of dye and green phosphor ceramics were investigated using UV spectrophotometry and photoluminescence spectrometry. Electrochemical measurements were used to optimize the weight percentage of fluorescent materials doped in TiO2 photoelectrode, which had higher conversion efficiency (η), fill factor (FF), open-circuit voltage (Voc), and short-circuit current density (Jsc) as a result. Anhydrous LiI, I2, poly(ethylene glycol) (mw = 20,000), nitric acid, and 4-tertiary butyl pyridine were obtained from Sigma-Aldrich (St. Louis, MO, USA), and TiO2 powder (P25) was obtained from Nippon Aerosil (EVONIK Industries AG, Hanau-Wolfgang, Germany) and used as received. Ethanol was purchased from Daejung Chemicals & Metals Co. (Shiheung, Republic of Korea), and water molecules were removed by placing molecular sieves (3 Å) in the solvent. Commercially sourced bis(isothiocyanato)bis(2,2′-bipyridyl-4,4′-dicarboxylato)-ruthenium(II)-bis-tetrabutyl ammonium (N719 dye) and 1,2-dimethyl-3-propylimidazolium iodide were obtained from Solaronix SA (Aubonne, Switzerland). Green phosphors LaPO4:Ce, Tb and (Mg, Zn)Al11O19:Eu were obtained from Nichia Corporation (Tokushima, Japan). The electrolyte solution consisted of 0.3 M 1,2-dimethyl-3-propylimidazolium iodide, 0.5 M LiI, 0.05 M I2, and 0.5 M 4-tert-butylpyridine in 3-methoxypropionitile. TiO2 powder was thoroughly dispersed for 10 h at 300 rpm using a ball mill (Planetary Mono Mill, FRITSCH, Oberstein, Germany), adding acetyl acetone, poly(ethylene glycol), and a Triton X-100 to obtain a viscous TiO2 paste. The doped green phosphors were added to the TiO2 paste and mixed in a ball mill for 2 h. The TiO2 and green phosphor-doped TiO2 pastes were coated onto fluorine-doped SnO2 conducting glass plates (FTO, 8 Ω cm−2, Pilkington, St. Helens, UK) using squeeze printing technique, followed by sintering at 450°C for 30 min. Approximately 8- to 10-μm-thick TiO2 film was deposited onto a 0.25-cm2 FTO glass substrate. Glass-FTO/TiO2 and phosphor-doped TiO2 electrodes were immersed overnight (ca. 24 h) in a 5 × 10−4 mol/L ethanol solution of Ru(dcbpy)2(NCS)2 (535-bis TBA, Solaronix), rinsed with anhydrous ethanol, and dried. A few drops of the liquid electrolyte were dispersed onto the surface, and a full cell assembly was constructed for electrochemical measurements. A Pt-coated FTO electrode was prepared as a counter electrode with an active area of 0.25 cm2. The Pt electrode was placed over the dye-adsorbed TiO2 thin film electrode, and the edges of the cell were sealed with 5-mm wide strips of 60-μm-thick sealing sheet (SX 1170–60, Solaronix). Sealing was accomplished by hot-pressing the two electrodes together at 110°C. The surface morphology of the film was observed by FE-SEM (S-4700, Hitachi High-Tech, Minato-ku, Tokyo, Japan). A 450-W xenon lamp was used as light source for generating a monochromatic beam. Calibration was performed using a silicon photodiode, which was calibrated using an NIST-calibrated photodiode G425 as a standard. UV-visible (vis) spectra of the TiO2 film and TiO2 electrode with green phosphor powder added were measured with a UV–vis spectrophotometer (8453, Agilent Technologies, Inc., Santa Clara, CA, USA). Photoluminescence spectra were recorded on Avantes BV (Apeldoorn, The Netherlands) spectrophotometer under the excitation of Nd:YAG laser beam (355 nm). Electrochemical impedance spectroscopies of the DSSCs were measured with an electrochemical workstation (CHI660A, CH Instruments Inc., TX, USA). The photovoltaic properties were investigated by measuring the current density-voltage (J-V) characteristics under irradiation of white light from a 450-W xenon lamp (Thermo Oriel Instruments, Irvine, CA, USA). Incident light intensity and active cell area were 100 mW cm−2 and 0.25 cm2, respectively. Figure 1 shows FE-SEM cross-sectional images of a TiO2 electrode doped with 5 wt.% of G2 (Figure 1a), G2 powder (Figure 1b), and a TiO2 electrode doped with 5 wt.% G4 (Figure 1c) and G4 powder (Figure 1d). The size of the two green phosphor powder particles varied from 3 to 7 μm without uniformity. These nonuniform micro-sized structures of the fluorescent powder could create porous and rough surface morphologies on the surface of and within the TiO2 photoelectrode. However, the maximum doping ratio was 5 wt.%. This type of structure has advantages for the adsorption of a higher percentage of dye molecules and also supports deeper penetration of the I-/I3- redox couple into the TiO2 photoelectrode. 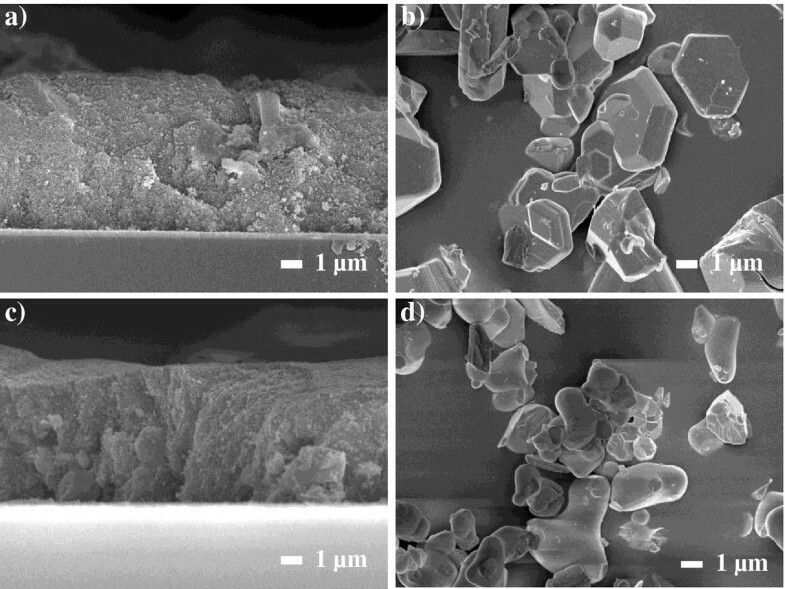 Cross-sectional FE-SEM images of TiO 2 electrode. It is doped with 5 wt.% of G2 (a), G2 powder (b), TiO2 electrode doped with 5 wt.% of G4 (c), and G4 powder (d). Figure 2a shows the absorption spectra of a pristine TiO2 photoelectrode (black curve), a TiO2 photoelectrode doped with 5 wt.% G2 (blue curve), and a TiO2 photoelectrode doped with 5 wt.% G4 (red curve). The electrodes listed in the order of active absorption area are G4-doped photoelectrode > G2-doped photoelectrode > pristine TiO2 photoelectrode. The absorption spectra indicate that more photon energy could be harvested. The effective spectrum ranges from 375 to 900 nm. These spectra cover a UV-visible-IR region. The emission spectra of G2 and G4 are shown in Figure 2b, which was obtained by excitation at 254 nm with the emission line at 517 nm for G2 and excitation at 288 nm with the emission line at 544 nm for G4. To determine the optimal contents of the dopant, optoelectric and electrochemical technology were used. The optimal content of green phosphor was 5 wt.%. Absorption of TiO 2 electrode and emission spectra of G2 and G4. (a) Absorption spectra of pristine TiO2 electrode. TiO2 electrode doped with 5 wt.% of G2, and TiO2 electrode doped with 5 wt.% of G4. (b) Emission spectra of G2 and G4. 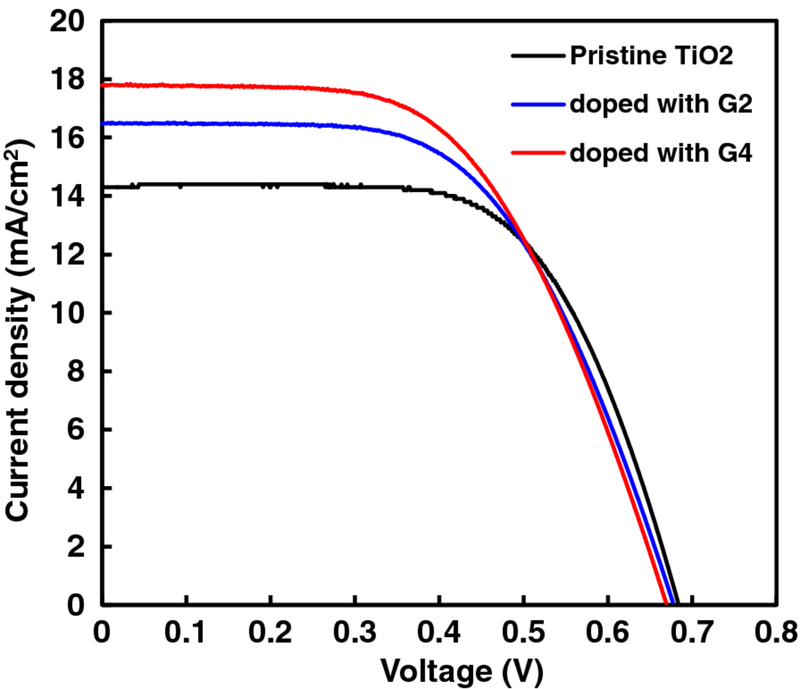 Figure 3 shows electrochemical impedance spectroscopy measurements for pristine, G2-doped, and G4-doped TiO2 photoelectrode. In these observations, the Nyquist plots of the impedance characteristics were obtained from the dependence of the real axis resistance (Zre) and imaginary axis resistance (Zim) along with the angular frequency. The diameter of the first semicircle at middle frequency illustrated in the spectra shows the charge-transfer resistance (Rct) between the TiO2 (or doped TiO2 with G2 and G4) and electrolyte. The bulk resistances (Rs) of the pristine, G2-doped, and G4-doped TiO2 electrodes are 12.8, 13.7, and 13.4 Ω, respectively. The Rct values of the pristine, G2-doped, and G4-doped TiO2 electrode devices are 26.3, 21.9, and 19.8 Ω, respectively. In the case of G4-doped TiO2 devices, smaller Rct means a decrease in interfacial resistance and an increase of energy conversion efficiency. The results show a significant effect on the internal resistance of the solar cell and, consequently, can affect the fill factor and conversion efficiency. Nyquist plot of the impedance characteristics between Z re and Z im . 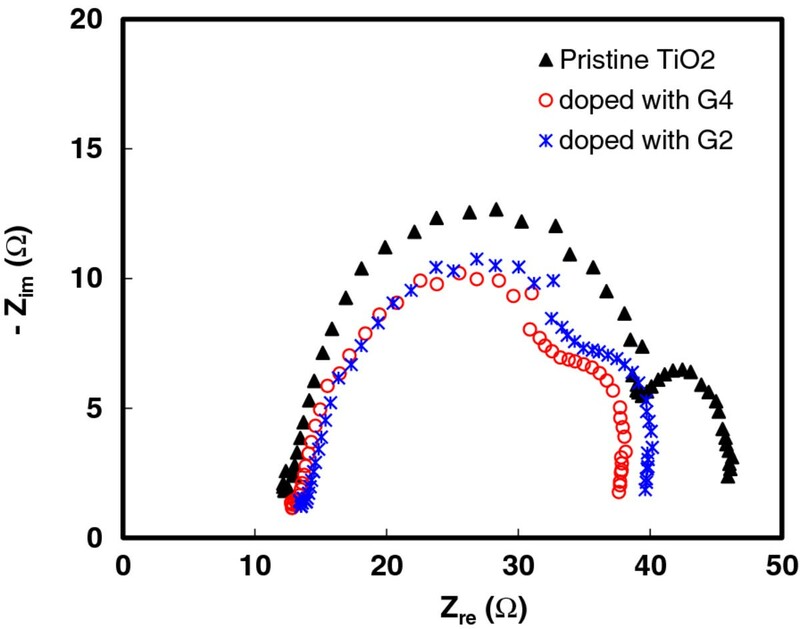 It is with the angular frequency ω = 2πf of pristine TiO2 electrode and TiO2 electrode doped with 5 wt.% of G2 and TiO2 electrode doped with 5 wt.% of G4. The incident photon-to-current conversion efficiency (IPCE) spectra show the cell of a pristine TiO2 photoelectrode doped with 5 wt.% G2 and 5 wt.% G4. The pristine TiO2 photoanode exhibits a maximum IPCE value of 55% at 530 nm, while for the cell with TiO2 photoanode doped with G2 and G4, the peaks reach 65% and 70%, respectively, as shown in Figure 4. 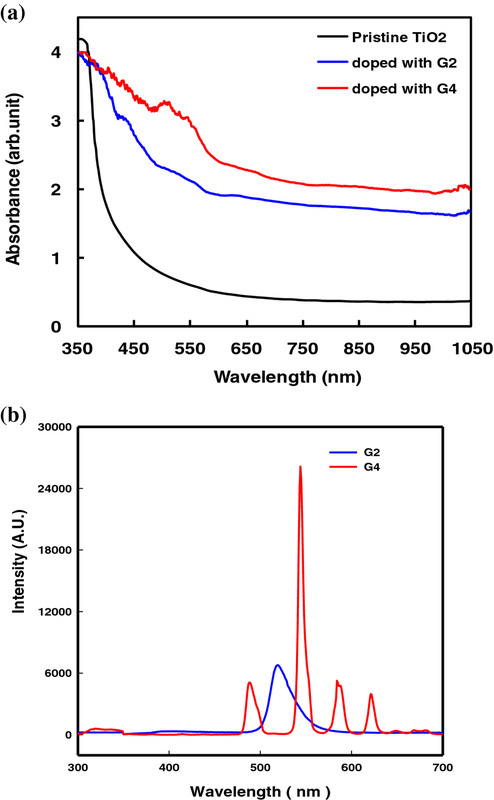 Moreover, an increase of IPCE value in the range of 550 to 650 nm for the cells with doped G2 and G4 photoanodes are observed due to the scattering effect of the G2 and G4 materials, which favor the improvement of Jsc for the cell . The increase in Jsc with the amount of luminescent powder like G2 and G4 are due to the longer wavelength absorbed which transfers to visible light (550 to 650 nm). Also, larger particle sizes in G2 and G4 powders can extend the light transmission distance, improving incident light harvest and increasing the photocurrent . IPCE spectra of pristine, doped with 5 wt.% G2, and 5 wt.% G4 TiO 2 electrodes. where Jsc is the short-circuit current density (mA cm−2), Voc is the open-circuit voltage (V), Pin is the incident light power, and Jmax (mA cm−2) and Vmax (V) are the current density and voltage in the J-V curve at the point of maximum power output, respectively. Figure 5 shows Jsc versus Voc characteristics of the DSSCs. The photoelectrochemical performance was measured by calculating η. The best conversion efficiency was 7.98% for the G4-doped device with a Jsc of 17.8 mA cm−2, a Voc of 0.67 V, and an FF of 0.67. The pristine TiO2 and G2-doped device efficiencies were 6.15% and 7.16%, respectively. The open-circuit voltage changed slightly with the insertion of green phosphor, from 0.67 to 0.68 V, while the fill factor changed with the insertion from 0.63 to 0.67, and the short-circuit current changed from 14.3 to 17.8 mA cm−2. For pristine TiO2, η was 6.15%, which increased to 8.0% for 5 wt.% fluorescent powder added to TiO2 (Table 1). The effect of different weight percentage ratios of fluorescent powder added to the TiO2 was also investigated, and 5 wt.% was the optimum ratio. The DSSC with only TiO2 had lower Jsc and Voc because it has a lower proportion of excitons. When the fluorescent powder was added, the number of photons increased and hence increased the probability of photon and dye molecule interactions. Our results suggest that the insertion of green phosphor provides optimal electron paths by reducing the surface and interface resistance, by changing the surface morphology of the electrode. Efficiency was increased by a factor of 2. J-V curves of dye-sensitized solar cell. It is based on pristine TiO2 electrode (a), TiO2 electrode doped with 5 wt.% G2, and TiO2 electrode doped with 5 wt.% G4. Photovoltaic properties include open-circuit voltage (V), short-circuit current density (mA cm−2), fill factor, power conversion efficiency (%), excitation wavelength (nm), and emission wavelength (nm). In summary, we have successfully introduced a 5-wt.% ratio of green phosphors G4 or G2 into the TiO2 photoelectrodes of dye-sensitized solar cells. The enhanced percentage of conversion efficiencies of devices doped with G4 or G2 were 30% and 16% with the open-circuit voltages of 0.67 and 0.68 V and the short-circuit currents of 17.8 and 16.5 mA cm−2, respectively. The fill factors were 0.67 and 0.64, respectively. The 5-wt.% doping ratio of green phosphor contributed to the reduction of the resistances of the surface and the interface of the photoelectrode and enhanced the absorption spectrum in the UV–vis and near-infrared regions. The internal resistances and absorbance of the photoelectrode directly affected the power conversion efficiency. Green phosphor plays an important role towards the realization of high-efficiency dye-sensitized solar cells. This research was supported by the Basic Science Research Program through the National Research Foundation of Korea (NRF), funded by the Ministry of Education, Science and Technology (2012010655). This work was also supported by the Priority Research Centers Program through the National Research Foundation of Korea (NRF) funded by the Ministry of Education, Science and Technology (2009–0094055). CKH and JJY performed UV–vis spectroscopic study and I-V result analysis. HSK fabricated the DSSCs. EMH performed the photoluminescence analysis. KHP drafted the manuscript. All authors read and approved the final manuscript.